World Football Commentaries: Carlo Ancelotti: "Stop games if there are insults from the stands." Carlo Ancelotti: "Stop games if there are insults from the stands." 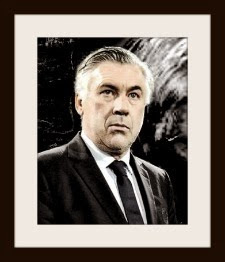 Carlo Ancelotti, manager of S.S.C. Napoli, discussed cultural, communication and tactical themes during the annual Panchina d'Oro. This event honors the best managers in Serie A, B, C and women's football, respectively. These coaching awards are presented at the headquarters of the Italian Federation in Coverciano. 1. On the differences between stadium experiences in Italy compared to England, France and Spain. 2. On how Italian football is more advanced on a tactical level. 3. On what he learned in English football. 4. On who is more advanced than Italian clubs. I began World Football Commentaries 12 years ago today. Thank you for your continued support of my work at this site. "On a cultural level in Italy, we are behind. We still think that a football game is a battle instead of an event. It's difficult, if not impossible, to be insulted in England. While in France, there is not the same level of passion as is found in Spain and in Italy. The fans are not as involved and as passionate. There is a fierce rivalry between Barcelona and Real Madrid in Spain. But there aren't bad manners as is seen in Italian grounds. Now we have an advantage if they can suspend games. If games can be suspended for rain (as happened to his own Napoli side a few days ago versus Genoa) and you can also stop them due to insults, you can do it. And I think we will be able to." "The tactical aspect is the most lacking one found in foreign teams. Above all on the defensive level, you find teams and players who have a lesser degree of knowledge. Italian football still remains very competitive under the tactical aspect and is very much in consideration. The Italian footballer and manager have more knowledge due to the experience that comes from Serie A where you play with different systems." "I learned a lot in England. I discovered a very different working methodology. They were already accustomed to carry out a combination of work between tactics and physical preparedness. And I became open (to these methods) and began to work like that. Language can be a problem. Not technical communication but rather motivational discussions. Or where you have to show emotions. From that point of view, working in a foreign country, we (Italians) lose something. You don't have an immediate and direct form of communication." "Where are they move advanced? Now there is a tendency to play football. There is not much difference. Football is globalized. Others are more ahead of us in structures and at the environmental level."